• 3-Coin Set includes: Kentucky Derby KY State Quarter, Preakness MD State Quarter and Belmont Stakes NY State Quarter. Here is your chance to own a complete set of three (3) colorized 24KT Gold Plated AMERICAN PHAROAH Triple Crown Winner Statehood Quarter Coins. These coins are Genuine Authentic Legal Tender of the United States, which have been layered in Genuine 24 Karat Gold. 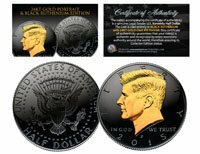 In commemoration of this enormous accomplishment, the Merrick Mint has released this Genuine Legal Tender U.S. Coin Set, with Race Day imagery using a special colorized process. This set includes a Kentucky Statehood Quarter for the Kentucky Derby Win, a Maryland Statehood Quarter for the Preakness Win, and New York Statehood Quarter for the Belmont Stakes Win. Each coin comes in a premium coin capsule. The 3-coin set comes with Certificate of Authenticity to Guarantee that your coins are authentic and recognized by every monetary authority around the world, assuring its Collector Edition status.